Lately you tell yourself that “Writer’s Block” is a medical condition without treatment – or at least your insurance does not cover it. (Since when did we start making our medical choices based on our insurance rather than our health?) Remember when we all started getting health insurance that had fixed, low or no co-payments to promote wellness, early detection and prevention rather than treatment? This month’s column is a prescription for every reader. It is a health habit message. Write often, write regularly and bring items for publication. Writing is good for you! So go ahead, pick a strategy or two from the writing habits, and create a steady diet of putting a few words down. Then set a schedule for your regular appointments. Consider articles like check-ups. Do not wait until something “big” happens to write. Send an article once a year – or four times a year would be even better! Everyone is busy, but seeing your words in print and bringing your journal to an audience can do you a world of good as a writer. Having a good “diet” of writing habits is an excellent lifestyle for health. Add a little regular exercise and you will improve your health as a writer. Make a schedule of regular appointments or deadlines for turning in articles for publication. The publications will affirm your health and reinforce your choices to live the life of writing. Once you have a schedule, you will need a process for producing an article. You may want to expand the process for larger writing projects like books. This column will use the example of writing an article for the Next-Step-of-Faith newsletter. For instance, I have a commitment to the Editor to turn in an article a month. I turn them in before the first and I have a writing process that works for me. The next three columns will be about developing your own writing process. This month is when you decide to take out the policy and schedule the appointments to assure your best health as a writer. Every writer has a unique voice. No one can write your story like you can. You give a gift when you use your talents to write for others. I want to encourage you to find a process that is simple and workable for you individually. If you would like help customizing the approach, let the Editor of Next-Step-of-Faith know you would like to enroll for free coaching. 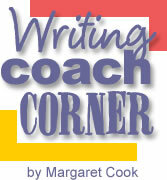 Each Next-Step-of-Faith writer can enroll for an individualized coaching process to produce one article. The next three columns will develop the approaches of clustering, outlining and the combined approach for defining your article and getting it written. Before next month, practice one of the strategies for developing ideas and material. You can also use the writer’s exercise at the end of this column to generate some ideas quickly. Take the “is” statements to the next level of the writing process by writing as many thoughts as you can for each phrase. At a recent writer’s meeting, we used some simple statements “______________ is” to generate at least three ideas. Each writer shared the ideas, metaphors and similes they had for the statements. Next-Step-of-Faith will feature a few of the writer's results on the website. Write your ideas first and then see what the writer’s group came up with to get the maximum value of the exercise. Writing is … for everyone exercise. One way to promote your create process is to take a few minutes to brainstorm on an idea or a phrase. This exercise will encourage some brainstorming and it can help you bring your ideas into living language by using imagery that will bring the reader and writer face-to-face. Compare your idea to something familiar to your writer. You may want to make a quick review of the most common way you can use language to make these connections vibrant. Now get some scrap paper – or some index cards. Select a few of the “________ is” statements and write one on each page or card. Then shuffle them or put them face down on the table and mix them up. Select them one by one and write as many ideas as you can think of for each statement. After you have completed the exercise, rank the cards you think have the most potential. You will want to look for ways to incorporate the images and ideas into an article for publication. You can also share your best ideas with other writers. Send your ideas to the Next-Step-of-Faith Editor today. Copyright © October 28, 2006 – Margaret Cook. All rights reserved.